—One Day, by Robert Blanco. Written for the second Inauguration of President Barack Obama, January 21, 2013. Melissa McGill’s light-based public art project, Constellation, arises from the romantic ruins of Bannerman’s Castle on Pollepel Island, a mysterious sight glimpsed from trains heading north 50 miles from New York City just shy of Beacon, and nearby to West Point and Storm King. 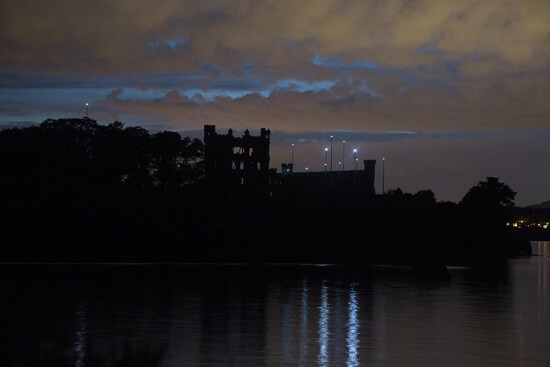 If you’ve ever wondered about this fleeting apparition, this art installation, which will be up for two years, is the perfect vehicle for visiting the island or gazing from the riverbank. Starting in 1884, Francis Bannerman VI, a pacifist who hoped that future wars were unnecessary, was the world’s largest dealer of used military items, operating the first Army/Navy surplus stores through purchases of enormous quantities of government surplus goods at auction. After his largest purchase of 90 percent of the captured goods from the Spanish-American War in 1898, he had a dilemma—storage space was limited in New York City and authorities frowned on housing his vast cache of explosives at the company headquarters on lower Broadway. 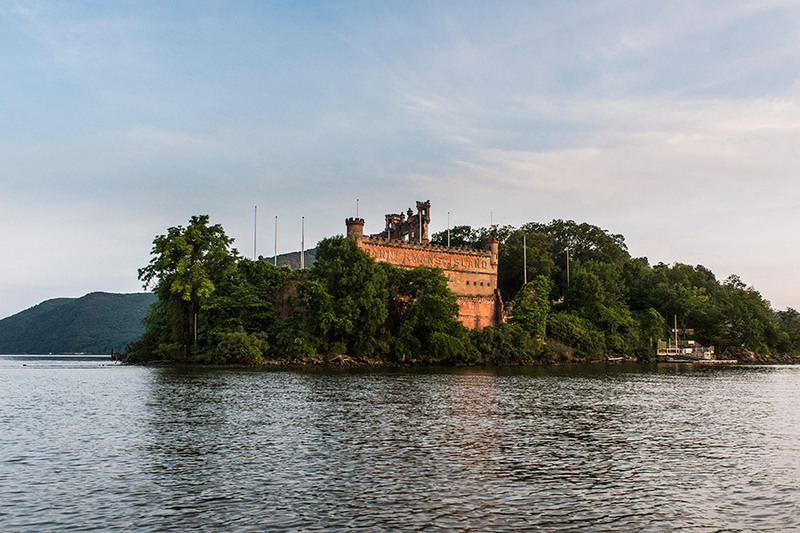 So he purchased Pollepel Island from Mary Taft of Cornwall in late 1900 and constructed a series of arsenals and houses of his own design in Scottish baronial style with Belgian influences, and a coat of arms with an invented crest including the Scottish flag, a grappling hook, and a flaming bomb. There was even a working drawbridge. 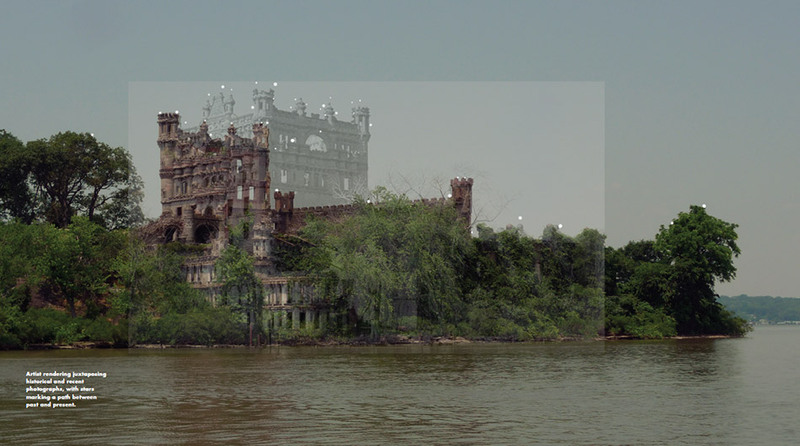 Bannerman designed his castle as an optical illusion: it looked bigger than it actually was. 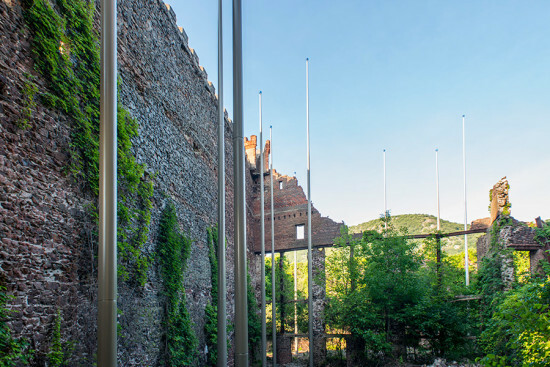 In the spirit of surplus, he built it out of scrap metal, blasted rock, brick, and concrete, and used old bedframes as rebar, and buoys as decorative balls. Cannons were placed throughout the island. today. What remains are thin stage-set facades seen from the riverbank, propped up by slanted long metal rods behind. Adding to the magic lantern quality is appearance by the Bannerman ruins in Alfred Hitchcock’s North By Northwest (1959) flashing by from a train; a two-second appearance in Michael Bay’s Transformers: Dark of the Moon (2011), along with Angkor Wat and the skyscrapers of Hong Kong, which serve as transporters to the inhabitants of the planet Cybertron to Earth; swum past by Joseph Fiennes in Against the Current (2009); and the secret location of George Washington’s tomb built by the Masons in FOX TV’s Sleepy Hollow. It was also the site of the April 2015 death of kayaker Vincent Viafore, while out with his fiancé Angelika Graswald. Constellations are our ways of creating narratives to connect the dots—or stars—giving the seemingly random order in the form of a figure, an action, or a myth. 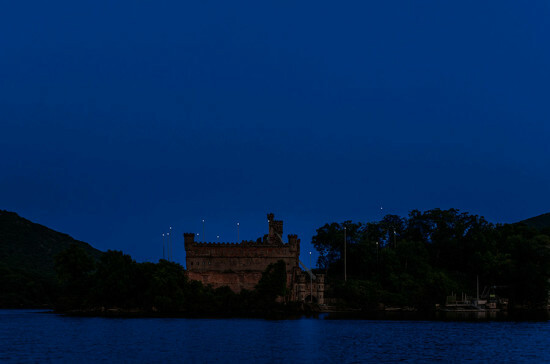 McGill has created her own Constellation with lighted points referring to the Bannerman castle structure still standing, as well as components that no longer exist, thereby connecting past and present. She also delves even further back to the Lenape, the indigenous Native Americans of the area, referencing their term Opi Temakan which means the White Road or Milky Way. In McGill’s reading, the natural and manmade are intertwined. She says it is absence and presence; fragments and pauses. Booking Boat and Kayak Tours, and Best locations to see Constellation on land here. Audio Guide, Video, Tour Information and more can be found here.